To Everything There Is A Season: 52 Uncommon Dates Book Review and Giveaway! We know we should do it. We talk about it and acknowledge the benefits; yet most couples find praying together is somewhat awkward, intimidating, or something we lack the time for. It's time to experience a breath of fresh air... in prayer. Ever since I got married three years ago I have heard many people tell me to "keep dating". All of the marriage studies and books also promote the idea of a couple to keep dating. That being said, I think many of these push the idea mainly for couples with kids. It's more difficult for them to go on "date nights". As a couple without kids and only one dog, a lot of the ideas behind date nights don't really relate to us. Many of the dates listed in this book are our daily lives on the weekend. We go on bike rides, we cook, we watch movies, we hike, and we play on the playground. Obviously this is not always the case but for couples that don't get to do these things on a daily basis this book is perfect. I would give this book to any newlywed or any couple who has small children. Some of my favorite date ideas are: Lego date, park bench date (sitting and reading the Bible in the park), sunrise date, and the cemetery date. This book really does have some great simple ideas. None of the things have to cost that much money. Many of the dates are not for small town/country folk. Going to the zoo or the arcade etc. these aren't always things they can do when the nearest anything is five hours away. There is enough variety throughout the book that the couple can get creative on the matter though if in this situation. The main part of this particular date book that I like is before and after each date the couple prays, and then they talk about what they did and how it honors God or how they can live out their faith. This also gives verses and other resources to read to go along with each date. This is a great book I really loved it. I recommend to any couple. 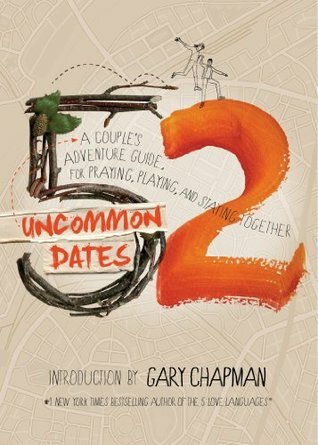 Enter below to win one paperback copy of 52 Uncommon Dates by Randy Southern! United States and Canada only please.